Don’t get stuck in a rut using your home decor accessories the same old way, year after year. Keep your home looking fresh by mixing and matching them and using them for a whole new purpose! All I have to do is look out of my windows to enjoy the beautiful spring show that Mother Nature is putting on right now. Trees and flowers are blooming and color is everywhere! 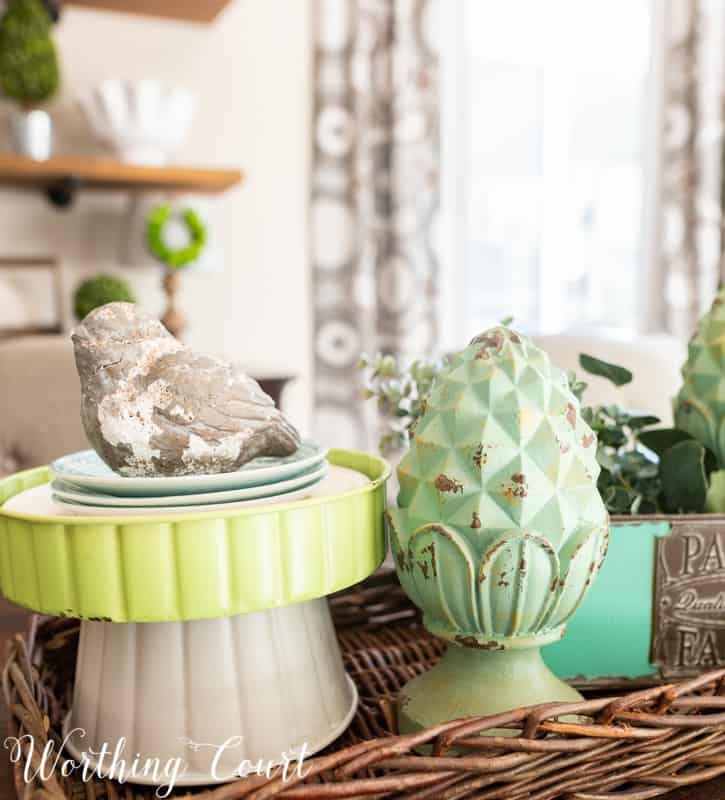 All of the beautiful colors outside are inspiring me to bring some color inside to freshen up my home for spring with beautiful home decor accessories from the Trisha Yearwood Collection available exclusively at Tractor Supply. This post contains affiliate links which allows me to make a small commission from your purchase, at no additional cost to you. See my full disclosure HERE. 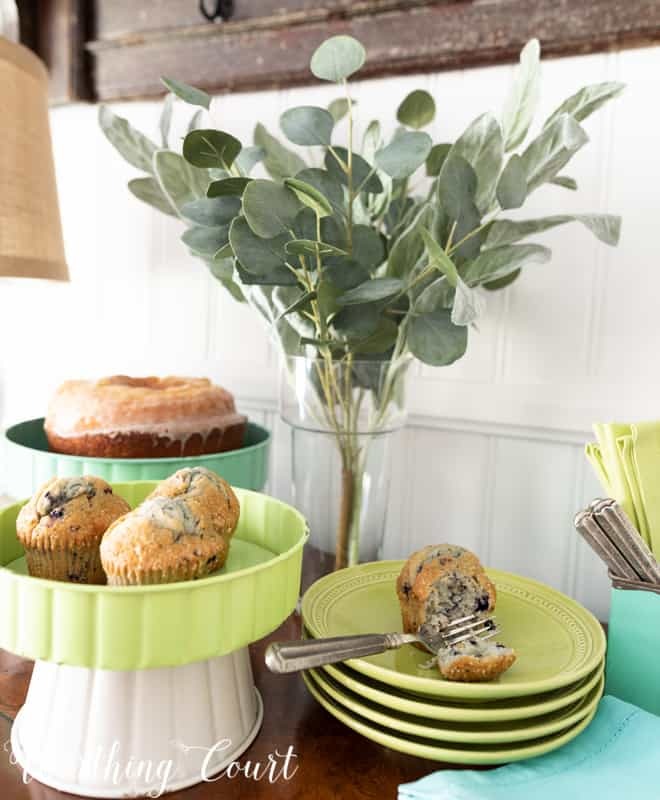 There are so many wonderful products in the collection to choose from, but I was most interested in bringing some cheerful color into my home for spring. I have oodles of accessories that seem to languish in my stash since they can only serve one purpose, so I challenged myself to only choose items that could be used multiple ways or in multiple places. This is everything that I ordered. By the way – there’s a direct link to each product that you can click on below the image, going from left to right. Be sure to scroll to the bottom to enter the giveaway for an e-gift card to Tractor Supply! THIS POST IS SPONSORED BY THE TRISHA YEARWOOD COLLECTION AVAILABLE EXCLUSIVELY AT TRACTOR SUPPLY. ALL OPINIONS ARE 100% MY OWN. I’m very impressed with the quality of each and every one of the items that I chose and especially love how well the colors work together. I’m excited to show you three different ways that I used them in my home! The very first thing that I did was to create a centerpiece on my breakfast table using all of the pieces that I ordered. I used my long wicker basket for the base, but I would have liked the centerpiece on a table runner just as well. I added a few plates and a chippy bird of my own to the smaller of the pedestals, some faux greenery to the planter and rested the pretty blue bird on a grapevine wreath on the larger pedestal. All things that say spring! Naturally, when you see a pedestal, you think of serving cake or food of some kind – right? So I set up a little dessert bar on the sideboard in the dining room to show how pretty the pedestals are when combined with colorful plates, napkins and blue jars for drinking sweet tea. 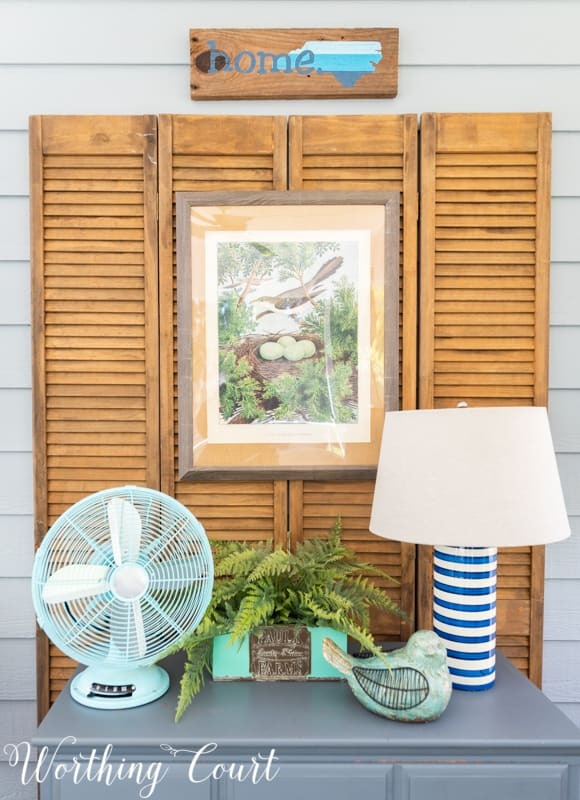 I only needed a couple of pieces to make a spring vignette that would enhance the vintage bird print above the chest on my screened in porch. As before, I love the way that the shades of aqua work so well with turquoise and blue! Tractor Supply is giving away a $50 e-gift card to go shopping online! To enter, simply leave me a comment telling me which item is your favorite from Tractor Supply’s exclusive Trisha Yearwood Collection. Click HERE to see all of the items in the collection. The contest is open until 11:59pm EST on Monday, April 27th. The winner will be notified via email. There is NEVER a disappointment when reading your blog. Your ideas are amazing! Love the metal box . That would be my favorite item as It is so versatile . I love the ceramic bird in the nest from your first picture. 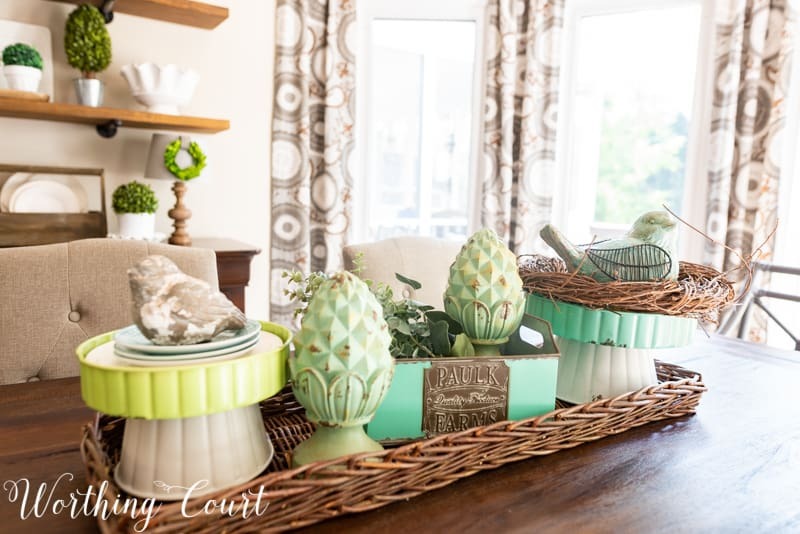 Your displays are so different and great inspiration for spring decorating, which we are all craving! I love them all but the aqua rectangle planter is super awesome! Suzy, my favorites are the distressed pineapples! My husband and I just went to Tractor Supply this weekend to purchase a power washer, and I must admit I was in awe of all of the beautiful home decor items they had! I even picked up a Mother’s Day gift for my mom. After seeing your displays, I may have to go back and look for this collection. Each item is beautiful and can be used in so many ways, but I think I like the rectangular container the best. I adore mason jars and I love the way it could be used to serve cool drinks on a warm summer day. Thanks for all of the wonderful ideas you share with each post. I truly enjoy your blog. Loving that distressed pineapple finial! Cute! Your vignettes are charming! Love the box–could be used for so many different things. Having experienced an ice storm just a week ago, this whole collection makes me think and dream that spring has finally sprung! LOve your blog. I like the bird the best. Thanks for all your ideas. I love that aqua rectangular planter. I need one of those in my life! Thanks so much for the chance to win. I love the aqua bird with the metal wings. The collection is great! 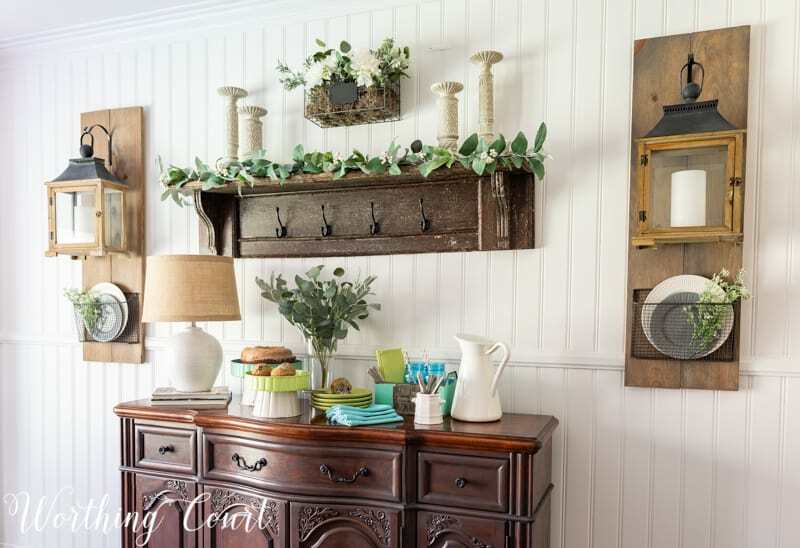 Love what you did using the Trisha Yearwood collection. I love how you use all the pieces for a vignette, and also move them for use as needed. I hadn’t thought to do that! Love it. Now I know what to do with some of my Spring pieces. You are always awesome with your creativity! You make it look effortless. Love the versatility of the collection…especially the box! As always, thank you for your inspiration! Suzy, So happy to have recently discovered your blog! The pineapple finials are my favorite…for sure…or at least until I look next time! I love bird statues!!! I love all the items and the colors are perfect for spring! The pineapples for sure! Love the color and since I collect pineapples am always searching for the next one. I love the honey bee vase! I have a thing for bees! I really like the bird. It seems like the most flexible piece and I love the touch of whimsey it adds. That is one amazing bird! Love birds and the pineapple is cool too! Although we visit Tractor Supply fairly often to pick up bird seed and other hubby must-haves, I don’t immediately think of them for home decor! 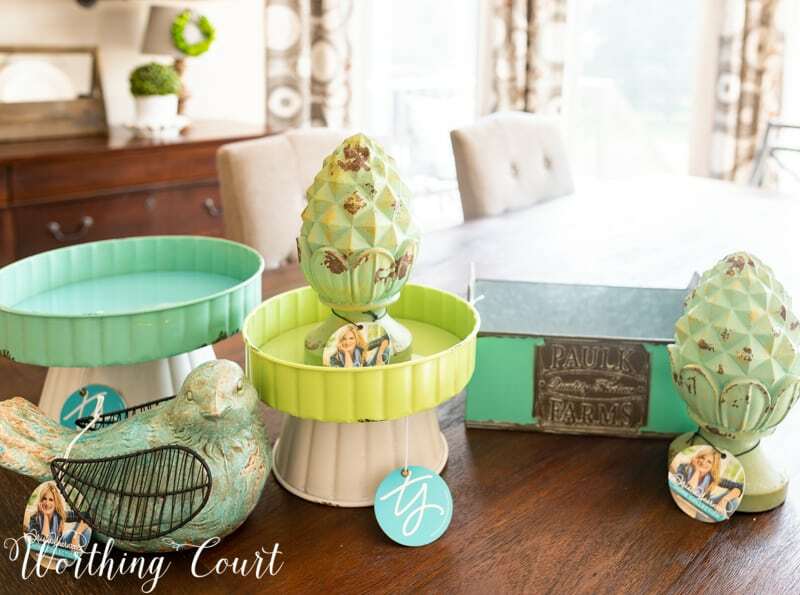 Now that I’ve seen this Trisha Yearwood collection, I’m in love with the pineapple finials in my front porch accent color and will order a couple to freshen up the look this year! Good morning Suzy. Everything is so “springy” from your new collection. I think the chicken wire lantern would look really cute on my break front. Love, love, love the colors! My favorite piece is the box; very versatile. OH MY! Just looked at all the fun things from Tractor Supply. I had no idea they had these types of things. Found a Trisha Yearwood lamp that I think I need. I’m amazed at how you make little decorative groupings. When I try something like that it just looks like a bunch of stuff thrown together. FUN! FUN! FUN! I love everything, but the Solid Color Metal Bin with Lid is my favorite. Great job! I love your photos and ideas. I would pick the Outer banks Sailboat. Love it! Who knew about this great Tractor Supply secret? I sure didn’t. My favorites are the distressed pineapple finials. But I love all things pineapple, have since the Wiliamsburg decor of the 80. I may have to get a couple. Thanks for sharing. Love it all. So many cute, useful items! I’m partial to the artichoke looking finials though. I love the bird–my granddaughter is nicknamed “Bird” and I collect all things bird! I love the bird–diffent from anything I have. I love the adorable aqua bird! It would be the perfect touch of color to my master bedroom for Spring. Looks like I’m going to have to visit my local Tractor Supply Store! I didn’t know Tractor Supply carried a home decor line. I especially love the Tin Cage Wall Pocket.Thank you for sharing these wonderful items. I so enjoy your posts and always get some wonderful and inspiring ideas. I really like the bird and the metal box, but everything is so nice! Thanks for the post. I love the pineapple finials. They are so versatile. Those distressed pineapples are just the cutest! Great post! Thank you! Thank you for introducing me to Tractor Supply. I had no idea what they sold. I would choose the aqua rectangular metal planter. Great ideas, thanks! I love the Ava Table Lamp … the black and white just pop. I have heard of Tractor Supply, but never paid much attention. Now I will be looking for these items. I like how you incorporated these pieces with things you already had. I like the acqua rectangle box because it is so versatile. Love the distressed pineapple . I wasn’t aware that Tractor Supply carried items like these. Wonderful colors I think my favorite is the bird. Enjoy your blog! Wow, who knew that Tractor Supply Co. had such amazing stuff in their store….i do love the Trisha Yearwood line. I will definitely have to make a point of stopping at Tractor Supply, now to do some shopping….thanks for sharing this info. I love the ceramic bird! Very fresh and spring like! I so love the blue ceramic bird! My sister suggested your blog to me I am so glad she did! We have Tractor Supply by us, and I hope to win a gift certificate and find something as a thank you for my sister. Absolutely love pedestals of any kind and the lime one is my favorite here. I love the distressed pineapples! I plan to make a trip to Tractor Supply soon! The cute ceramic bird is adorable, as is the pedestals!!! 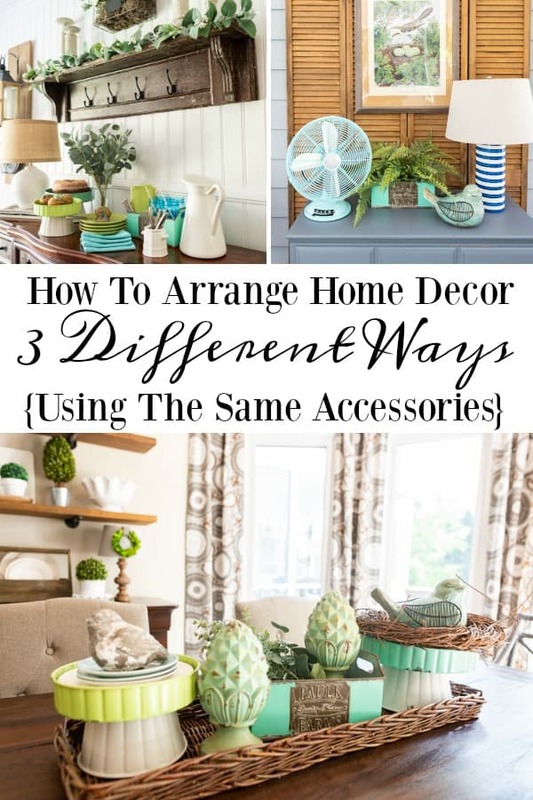 Your blog never disappoints…there’s always great ideas on using items multiple ways in multiple places. Wow, i always love your green blue combination. You really out did yourself!! I like the tin wall pocket and the Jasper Farms pillow. I love the persimmon lamp; quite pricy but very lovely! I love all of them, but the distressed pineapple finials are really calling my name! The Aqua Rectangle Planter is my favorite – in fact there is a new Tractor Supply store in Piedmont, OK that was on my stop list to pick up some birdseed. The people that work at that one and the one in Edmond, OK are the most wonderful people I have ever done business with. The distressed pineapple is awesome! I was just looking yesterday online for pineapple or artichoke finales. The aqua bird with metal wings is beautiful, too. 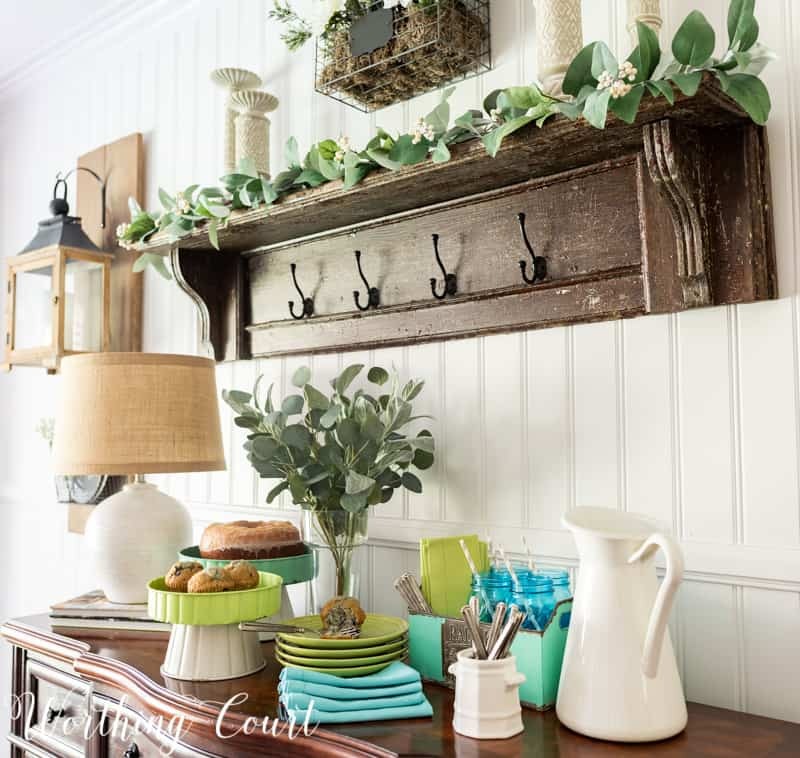 Farmhouse decor is just popping up everywhere! We just had a Tractor Supply open near us, hadn’t been in yet, guess its time to go shop! I think the pineapples are my favorite too but saw a few more items online that look great. I personally LOVE the aqua bird! That bird could be placed virtually anywhere in the house! I like all three of your treatments, but really love the one shot of your screened porch. Thanks for sharing!! On the dream pendant light is a dream. We are finishing up new (to us) condo in Palm Desert California. Since living at the beach is just to “pricey,” we decorated the condo using 6 six different sea glass paint colors on our walls. The painter thought we were CRAZY, but we love it! Accessory colors are in the aqua, turquoise and sea green shades. All of the Tricia Yearwood Accessories would make wonderful additions to the personality of the entire condo. However, I think that the rectangular metal planter could go absolutely anywhere, in any room! Thanks for all of the great ideas! I have to admit I have spent some time in my local TSC drooling over the Trisha Yearwood home decor items. I really like so many of her items, but I really LOVE the the bluebird kitchen canister set. What’s not to like? BUT if I have to pick, I guess it would be the planter…great color and shape. I’m loving the blue bird! I seem to be taken with all things birds this spring. I have purchased 5 new birds to add to my spring collection this year. Until this spring I only owned 2 white doves. 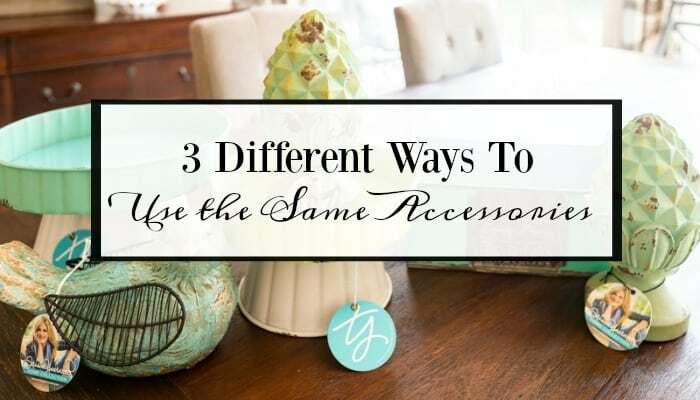 I love your 3 ways to use the collection. You are so creative! I like the Trisha Yearwood Home Collection Wood Chair with Flower Pot. Thanks for the giveaway, Suzy! I love the metal box. I can think of so many ways in which to use it! Thanks for your tips! 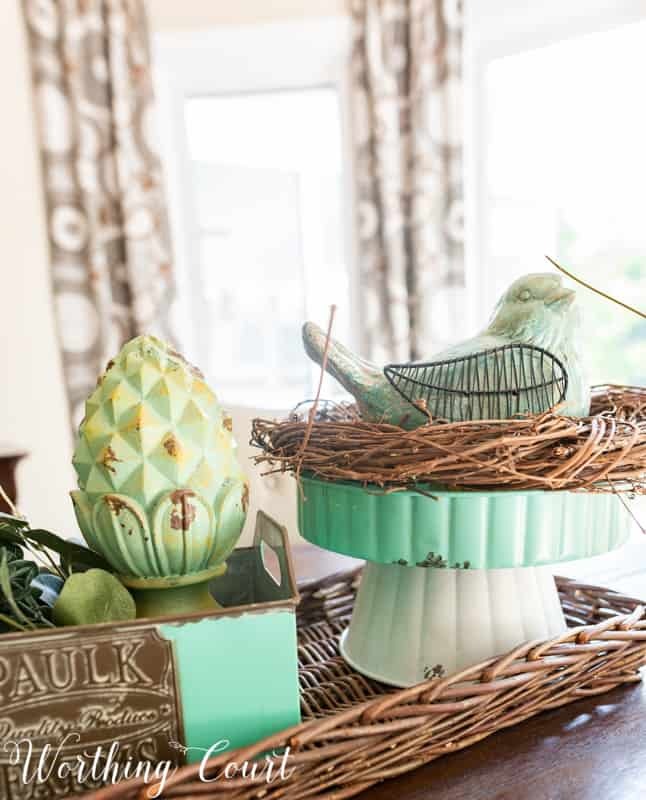 love, love, LOVE the bird and the pineapple finials…live near a Tractor Supply would love to shop there …thanks for the giveaway! The bird! It is a perfect example of farmhouse decor! So pretty! I love the bird and the aqua planter. They would go perfect on my porch! Thanks for sharing. 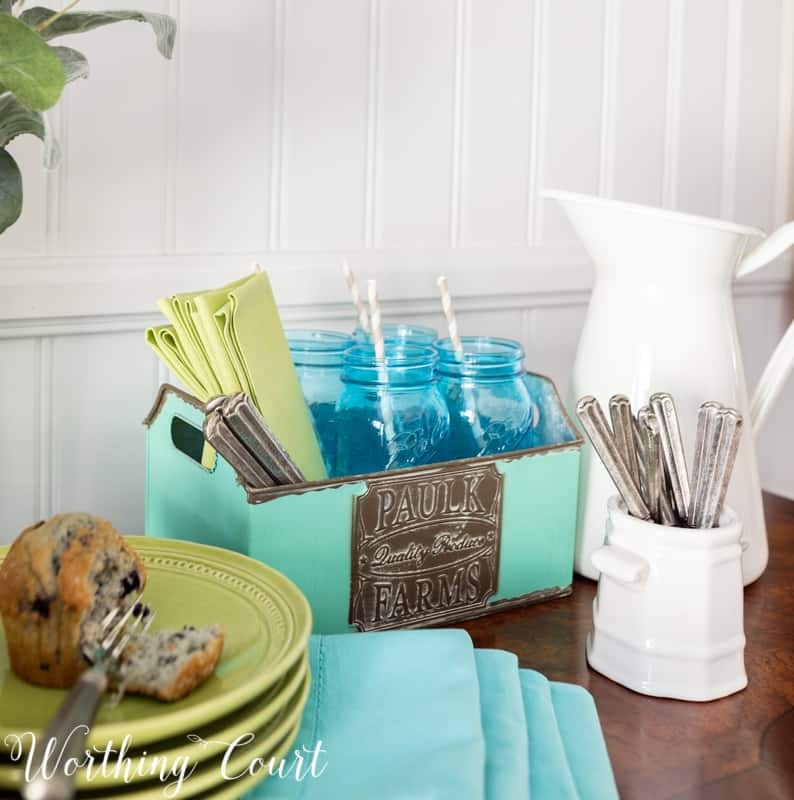 The little metal turquoise container can be used in so many ways! I love it!! Love the pineapple finials and the pedestal servers and love how you decorate. My favorite is the honey bee spice cubby! Your choices are great, too! I loved all the whole collection and loved the styling you showed. My favorite is the aqua Pedestal Server in Large size. Love your style and your willingness to be frugal when necessary. We all have tight budgets. My goodness! That songbird drink dish is begging to hold pillow mints or chocolates on my nightstand!!!! Also where on earth did you get that fan???? Don’t hold out on me, lol. LOL, Veronica! The fan came from HomeGoods a couple of years ago. I actually saw some of the Trisha Yearwood collection in store and they had a few perforated lanterns I really liked. I really like the Trisha Yearwood Luxe Glass Hurricanes, Set of 3. Thanks for a very informative post. I had no idea Tractor Supply had so much home décor. I love how you incorporated your new accessories in three different rooms and settings. The new colors work really well with almost any color scheme. 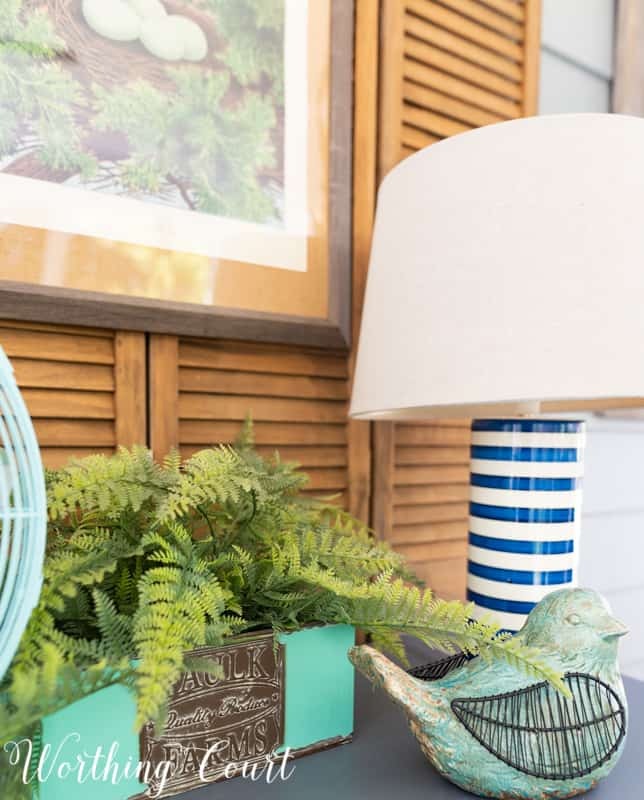 I LOVE the pineapple finials and aqua metal planter. I think the persimmon serving bowls are so pretty and versatile! I love the Large Aqua Pedestal Server! 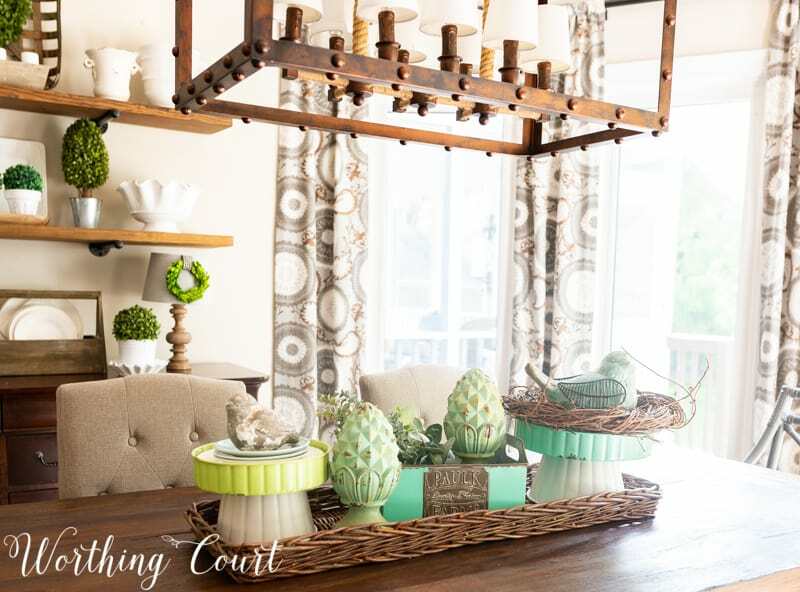 Thanks for sharing this because I hadn’t seen Trisha Yearwood’s new collection and its so beautiful! I especially love the aqua! Love all your tips too! Blessings! What a great collection-cheers to Trisha! I like so many items and will be checking them out. But especially the galvanized items and the pretty ceramic birds. Love the blue ceramic bird in a nest, first picture if I have to pick just one. Great article! I am a displaced New Englander so I am partial to the pineapple finials. Pineapples being the Colonial symbol of hospitality.